Fed Chair Ben Bernanke on Tuesday, at the National Association for Business Economics 50th Annual Meeting, signaled the Fed’s readiness to lower interest rates. Mr. Bernanke began his remarks by saying that the current situation of financial systems in the U.S. and in much of the rest of the world remains under significant stress, particularly the credit and money markets. Mr. Bernanke continued to talk about economic activity that is likely to be subdued during the remainder of this year, and how the heightened financial turmoil may well lengthen the period of weak economic performance and further increase the risks to growth. Bernanke suggested that the combination of the incoming data and recent financial developments indicate that the outlook for economic growth has worsened and that the downside risks to growth have increased. At the same time, he said – the outlook for inflation has improved somewhat as oil and other commodity prices have eased, though it remains uncertain. Bernanke pointed out that households with good credit are facing difficulties obtaining loans, banks are reducing credit-card limits and denial rates on auto loans are rising. 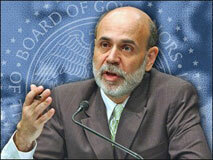 This will all serve to restrain growth in the weeks ahead, Bernanke said. The Fed Chairman also discussed how financial instability, together with the associated declines in asset prices and disruptions in credit markets, can take a heavy toll on the broader economy if left unchecked. He noted that for this reason, the Federal Reserve, the Treasury, and other agencies are committed to restoring market stability and are working hard to ensure that the financial system is able to perform its critical economic functions. Bernanke concluded by saying that steps being taken now to restore confidence in our institutions and markets will go far to resolving the current dislocations in the markets. I believe, he said – that the bold actions taken by the Congress, the Treasury, the Federal Reserve, and other agencies, will lay the groundwork for financial and economic recovery. Earlier Tuesday, the Federal Reserve announced an unprecedented step to purchase commercial-paper directly from issuers to help thaw a freezing market.